Attending a Burden Kahn Mansion wedding is like taking a step back in time. The gorgeous architecture and meticulous attention to detail is reminiscent of days gone by. If you're looking for a wedding venue with a beautiful, old-New-York feel, then a Burden Kahn Mansion wedding might be exactly what you need! There are technically two mansions available for events at this amazing East 91st Street location. The first of those two is the Otto Kahn Mansion. Each space has a specific charm unique to that location. Combined, they are a powerhouse of locations sure to please even the most discerning New York bride or groom. Do you like gold? Then you'll love the Assembly Hall at The Otto Kahn Mansion. From the delicate parquet floor to the gorgeous grand chandelier, this room exudes a quiet grace and grandeur. The gold touches are a brilliant finish to this exquisite space. The Grey Stone Foyer is located directly next to the Assembly Hall. It's a gorgeous space that truly brings the outdoors indoors, with its' amazing courtyard view. I especially adore the fireplace and gorgeous ceilings in this truly unique event space. If you're having a wedding, cocktail party, ceremony, or small reception of a hundred guests or less, then the Courtyard at The Otto Kahn Mansion might be just what you're looking for! The most striking feature of this particular space is the brilliant views of Central Park. This courtyard is part of both The Otto Kahn Mansion and The James Burden Mansion. From marble walls to spiral staircases, the James Burden Mansion offers everything that you could need for a flawless wedding and reception celebration. If you are getting married in Manhattan, and part of your day is to take place outdoors, then chances are you've worried about the weather. This image goes to show that even if it rains on your wedding day, you can still have remarkable pictures! I love these two clear umbrellas. 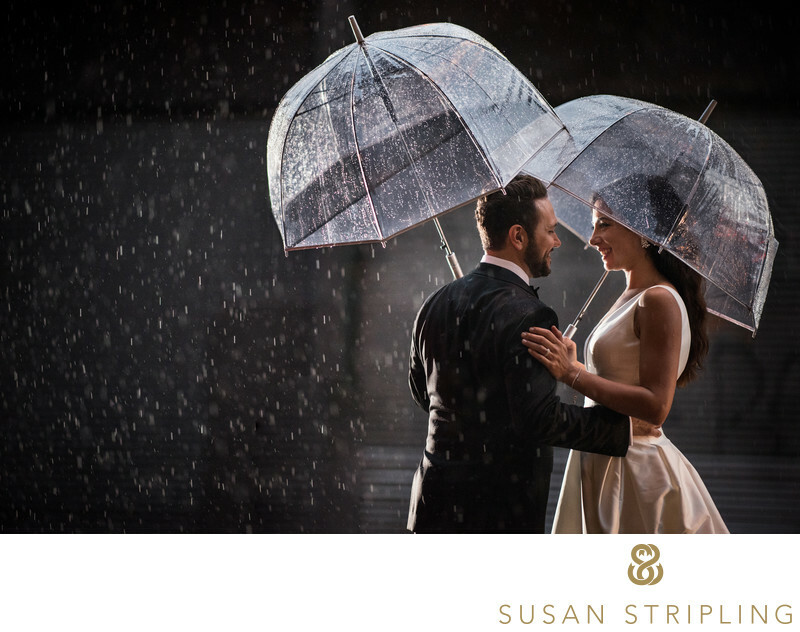 You can clearly see the bride and groom through the umbrellas, while the streaks of rain truly emphasize the fantastic ambiance provided by the rainstorm. 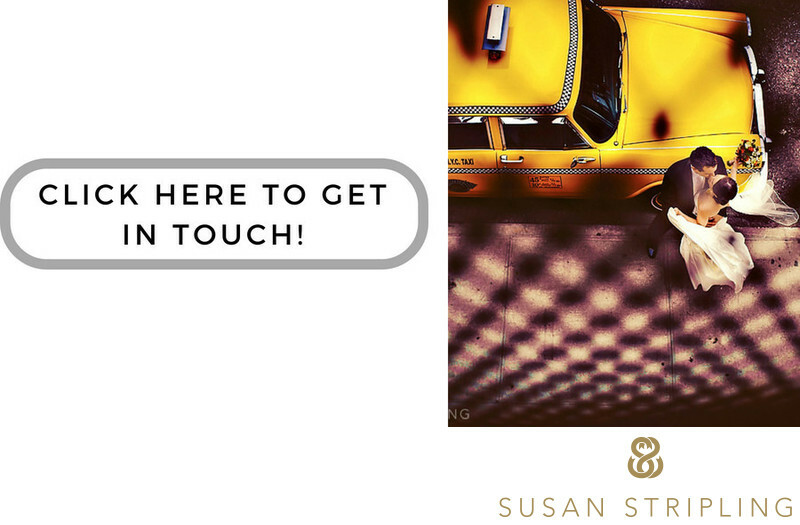 I am so appreciative to this incredible client. Many brides and many grooms would not be willing to go out in rain, thunder, and lighting for wedding images! These two were total troupers, willing to do whatever it took to get standout portraits on their wedding day. If it looks like rain on your Manhattan wedding day, never fear! Just pack a few pretty umbrellas, your most adventurous spirit, and lets hit the streets for some amazingly unique portraits! 1/250; f/1.4; ISO 2200; 105.0 mm.